John Hicks, age 19, died Saturday, August 13, 2005. Funeral Services will be held Monday, August 15th, at 2 p.m. at the Hwy 36 Church of Christ with Dr. Ed Headrick and Jon Schwiethale officiating with burial to follow in the Tecumseh Cemetery under the direction of The Hamil Family Funeral Home. Visitation will be held Sunday, August 14th from 5 to 7 p.m. at The Hamil Family Funeral Home, 6449 Buffalo Gap Rd., Abilene, TX. John Michael Hicks was born on May 28, 1986 in Abilene, Texas to parents Mike Hicks and Tammy Armor. 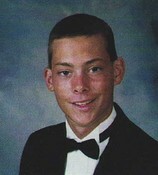 John was a 2004 Honor Graduate of Jim Ned High School and was involved in FFA and athletics. He played tennis and football; but baseball was his sport of choice. He lettered three years at Jim Ned in baseball; and in his senior year they won District for the first time in ten years. John was a member of Jim Ned Valley Church of Christ and was attending Tarleton State University. John was preceded in death by his grandmother, Kay Hicks. John is survived and lovingly remembered by his mom, Tammy Armor, of Tuscola; and father, Mike Hicks and wife, Vicky of Clyde. Also his brothers: Austin Windham, of Tuscola and Michael Hicks, of Clyde along with step-brother: Zane Simmons and step-sister: Tori Simmons, both of Clyde. Grand- parents are: John and Kathleen Armor, of Tecumseh, and Harold and Rhonda Hicks, of Clyde. Aunts and uncles include: Darlene and Randy Tyler, of Clyde; David Hicks, of Eastland; and Julie Hicks, of Mansfield; along with cousins: Lucy and Tamara Tyler and Morgan and Colby Hicks. Memorials may be sent to Tecumseh Cemetery Association or West Texas Rehabilitation Center.